We could say that a lot of legal documents has been part of our lives, either temporary or permanent. Since the law and such legalities have been established, legal documents have become an important part in our lives. Whether the law is on our side or against us, there is no escaping having to face and deal with these legal documents. One of the important documents that we should care to know of is a general power of attorney. 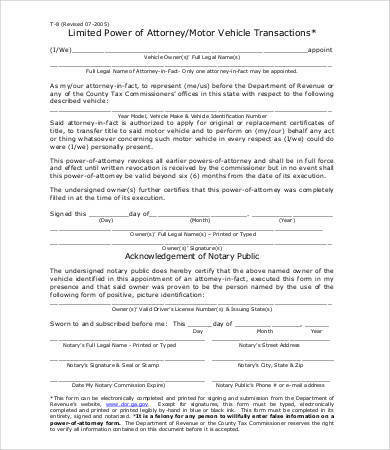 You may also see blank power of attorney forms. A general power of attorney is a form of consent or power bestowed to an individual so that they can do something for them. This is what we are going to focus on in this article. 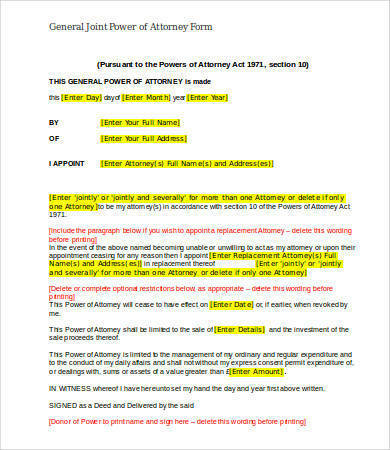 To accompany our discussion, we have included 14 general power of attorney templates in PDF and Word. You may download them for free and use as your reference as you go through this article. Feel free to check them out below! 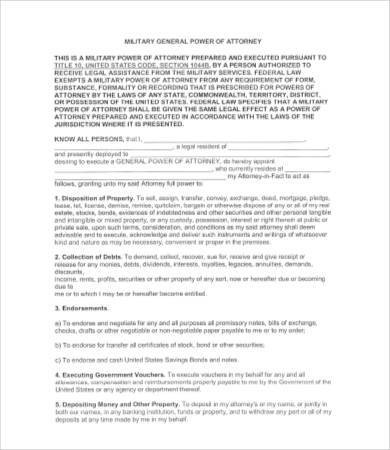 A power of attorney or POA is a legal document used to authorize a person who has been granted with rights to do things legally on behalf of another person. It is also called letter of attorney. The person who gave authorization to another person to act on their behalf is called the grantor or donor. The person who is authorized to do the other’s bidding or wishes does not always have to be an attorney or a lawyer. This person could be the grantor’s wife, husband, brother or sister, close friend, or even their children, and they are referred to as the attorney-in-fact. There are a number of things that a person bearing the power of attorney can do and that includes representing them in private affairs, businesses, management of properties, medical care, finances, and other legal matters. The power of attorney is also often used in instances when the grantor becomes ill or disabled, or if the grantor cannot be present in signing of legal contracts and documents due to some unforeseeable causes. The authority given to the bearer may be broad or limited, as in a limited power of attorney, depending on the grantor’s needs or what they see fit. Most responsibilities that are given to the agent or to the attorney-at-law are heavy responsibilities, that is why it is very important that the grantor or donor should carefully consider whom they will grant this power to. When granted to the wrong person, it may cause damage to one’s family or business, and the effects may be irreversible even if the power of attorney granted is already withdrawn. There are five main types of powers of attorney and each type is used specifically for some purposes, with their own respective scopes and limitations. They are non-durable power of attorney, the durable power of attorney, the special or limited power of attorney, the medical power of attorney, and the springing durable power of attorney. Each of these types are discussed below. 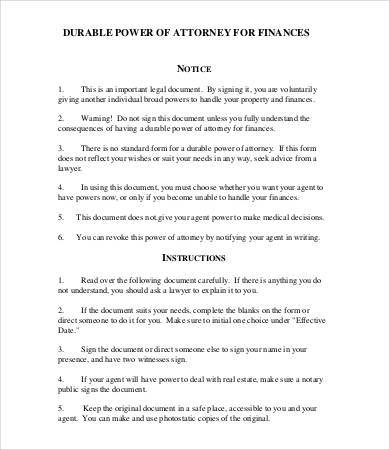 This type of simple power of attorney is often used to grant authority to another person to act on their behalf, like opening and managing financial accounts. 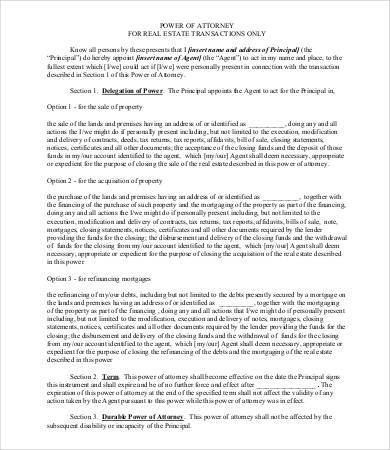 It is granted in order for particular transaction to be done and once that transaction is completed, the power of attorney granted is also terminated. Other instances when a non-durable power of attorney is terminated is when the grantor becomes incapacitated, passes away, or if the power of attorney is revoked. Contrary to that of a non-durable power of attorney is the durable power of attorney. With this type, the authority given to the agent by the grantor does not expire or does not terminate when the grantor gets incapacitated or passes away. Instead, it becomes effective immediately when the grantor gets incapacitated or dies. There is basically no time limit as to how long the agent is given authority to manage the affairs and finances of the grantor because of the durable clause that maintains it. 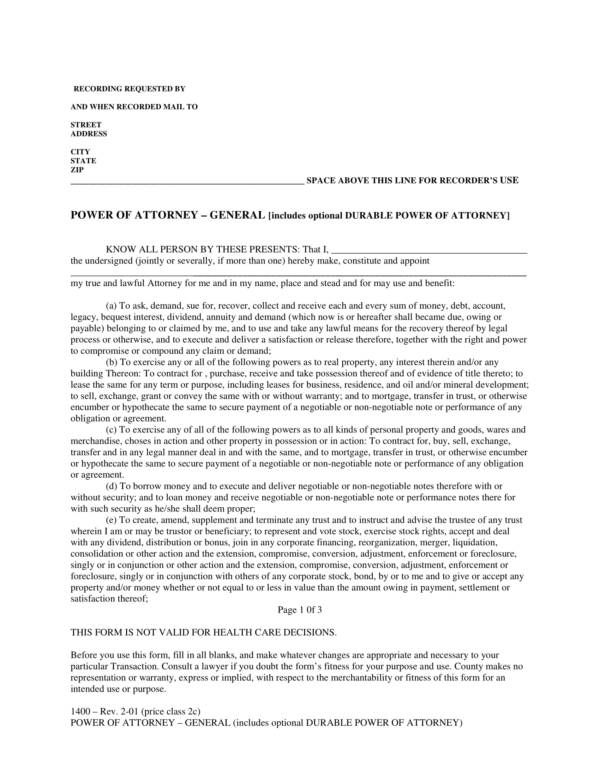 A special power of attorney or limited power of attorney is called such because the authority it grants to the agent is only limited to a specific task or areas, and often one-time transactions. These one-time transactions could be any banking or financial transaction where the grantor cannot be personally present because of an illness or an already planned commitment. The agent cannot do anything else or act on behalf of the grantor aside from the specific task assigned to them. As its name implies, a medical power of attorney is used to grant an agent or another person the authority to make health care or medical decisions in behalf of the grantor in cases when they become incapacitated or unable to make decision of their own. This is of course with the consent of the presiding physician. 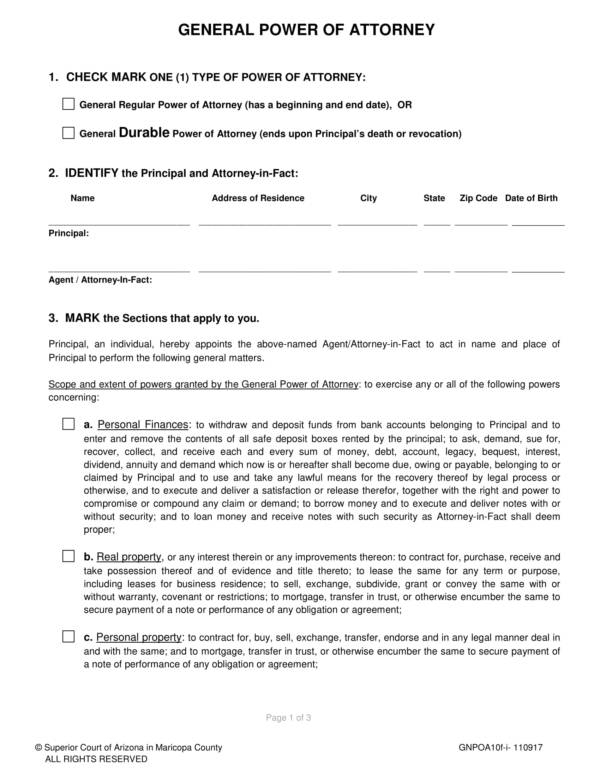 This type of power of attorney may seem the most flexible among the five types as authority is granted to the agent or attorney-at-law anytime in the future when the need arises. An example would be when the grantor is away or on a business trip and is unable to show up in an emergency meeting or gathering. A springing power of attorney can either be a non-durable power of attorney or a simple durable power of attorney. Having knowledge about the different types of power of attorney will help you determine its scope and limitations as well as help you choose which person to grant to act on your behalf. For more about powers of attorney, you may check out our website. We have there sample financial power of attorney forms and blank power of attorney forms. 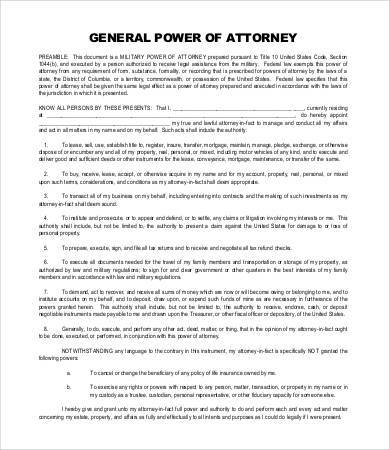 Now that you know what a general power of attorney is, the different types, and its many different uses, it is about time that you also learn about why it is considered an important legal document. 1. You can legally assign a trusted person to act or do something on your behalf if in case you cannot be personally present to do them. This is very convenient as there will really be instances when you need you would wish that someone could stand in your place or do something under your authority. 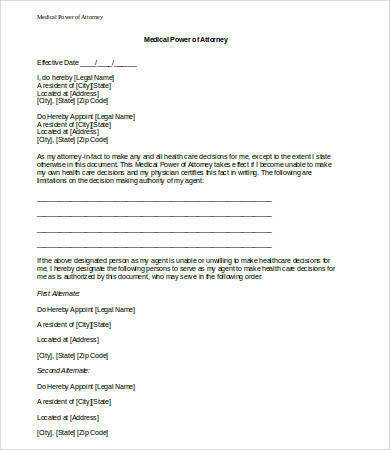 You may also see health care power of attorney forms. 2. If you become incapacitated and unable to make decisions on your own, you can grant the person you trust your life with to decide on the best and the right treatment that you should be given. 3. You can have someone to help you manage your finances with very little possibility of theft or fraud. This is because you are the one who can personally choose to whom you want to give such authority to. You may also like sample financial power of attorney forms. 4. There are limitations to the authority provided to the person who is acting on your behalf. This means they cannot just do anything that they want unless you give them full authority. 5. It is possible to have two or more agents to either work individually or work together to accomplish the tasks that you want them to do on your behalf. 6. Unplanned meetings or emergency meetings are critical and tough to handle, especially if they are about a merger or a partnership agreement. A person who can be there and decide on your behalf is convenient and can save the merger or the partnership form going to waste. 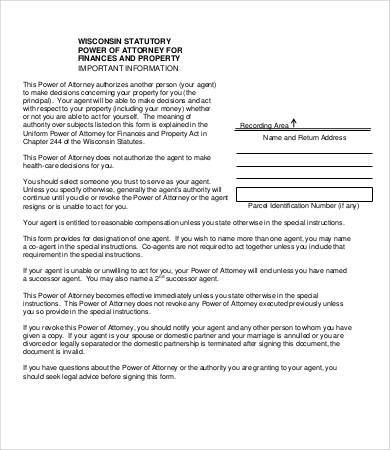 A document that you can use to assign somebody to act on your behalf is definitely one that a lot of people needs. This is basically what sets it apart from all other legal documents that are being used today. Other varieties of legal documents can be downloaded on our website. To name a few are affidavit of loss samples and templates, legal statement samples and templates, and sample business agreement contracts. Giving someone your authority to do things under your name or on your behalf is something that should not be taken lightly. It is true that doing this is convenient because at some extent it can make your workload lighter and can give you more free time that you don’t usually get. But tied to that is the possibility that the person whom you gave authority to might just turn their back on you or use that authority against you. You may also see advance directive forms. 1. 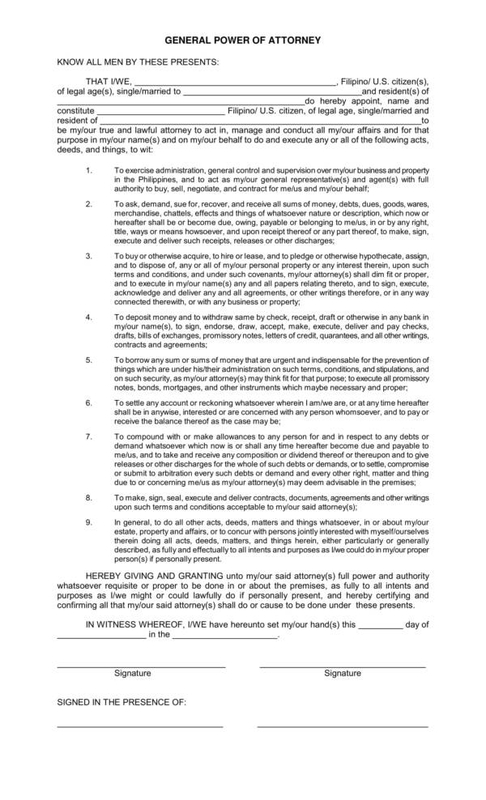 Trustworthiness – Now this is a big deal when deciding whom to name your power of attorney. Remember that you are giving this person authority to do legal things on your behalf, manage your finances, and even decide for your health care and medical needs. It is outright important that this person is someone whom you trust and whom you know will never do you any harm. You may also like general release forms. 2. Proximity – The person who you grant authority to should be just near you or within the same city as you do so that they would be there immediately when you need them. It is not really a legal requirement but it will be to your advantage as the location of this person will depend on how accessible they are to you or not. 3. Assertiveness – Acting on behalf of someone may not always be an easy thing to do, so you must take into consideration the assertiveness of the person you are looking for as a candidate. You will need someone who is tough enough to face the heavy responsibilities ahead of them and those who can handle any situations well. 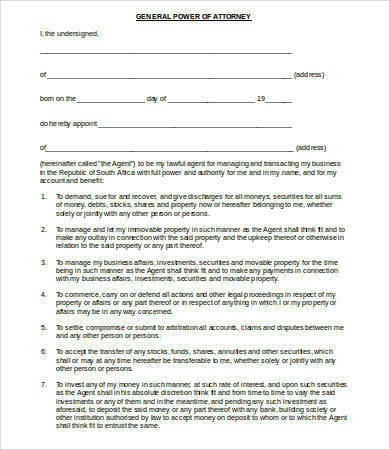 You may also check out sample grant deed forms. 4. Familiarity – Another thing that you should consider is your familiarity with this person. It is best that you choose someone who knows you and are in agreement with your way of thinking and values, whether it be personal values or business values. 5. Qualifications – Your candidates should also be qualified to be called attorney-at-all. Different states have their own set of qualifications, so before you start narrowing down your list of candidates, you might need to check out the qualifications required in your state. You might be interested in beneficiary release form templates. 6. Age – One factor that you must also consider is the age of the person to whom you will be naming your power of attorney to. It is advisable that you choose a person who is not older than you or who lacks the life experiences that you have gained, but is still qualified to act on your behalf. This is because someone older than you might die earlier and someone who does not have enough life experiences as you do may not make the appropriate decisions you expect them to do. 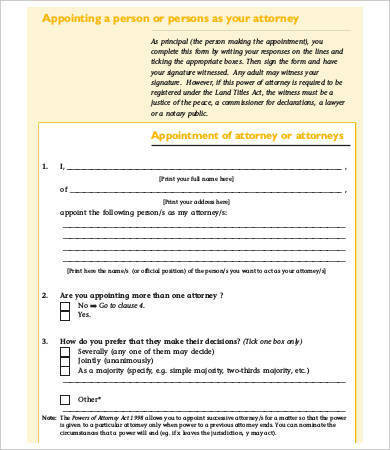 You may also see sample blank affidavit forms. There may be a lot more factors that you must consider when naming your power of attorney that are not stated above. There may be personal factors that you want to include or specific characteristics that you are looking for in a person. That is just fine as long as you feel that your decision is right and that things are to your advantage. Other related topics you may be interested in are sample health care power of attorney forms, sample authorization letters, and many more! How Much Does It Cost to Get a Power of Attorney? The above factors will affect the cost that you will need to take care of. There are situations where there are no costs for filing a power of attorney while there are also situations where it may cost you $15 to $50. And there is also the possibility that it may cost you more than that. The best thing you must do is check it out with people who have tried getting a power of attorney or go directly to the government authorities who are regulating it. 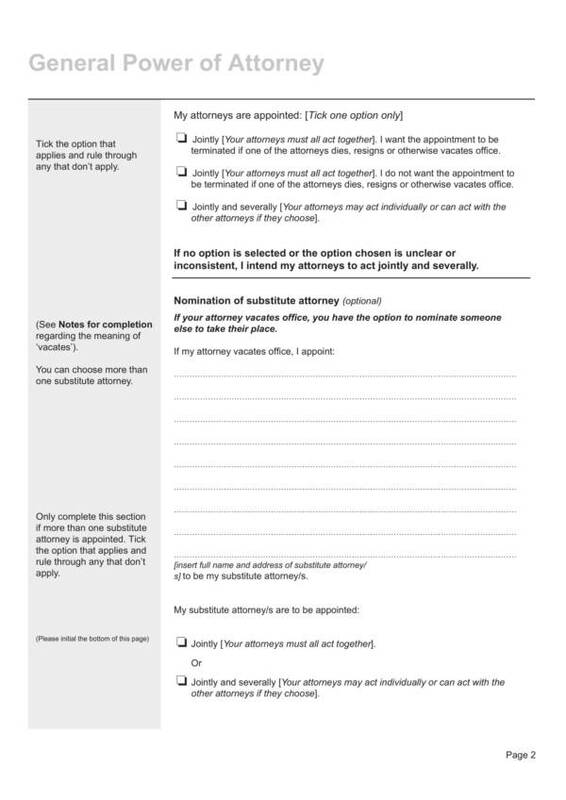 You may also like sample advance directive forms.